Numerous interventions have been implemented at farmers markets across the United States in recent years in order to increase Supplemental Nutrition Assistance Program (SNAP) redemptions. These initiatives include ensuring that farmers markets have the technological capability of accepting SNAP and implementing financial incentive programs that provide matching benefits for the redemption of SNAP benefits. While a main objec­tive behind these initiatives is to increase revenue to direct marketing farmers, it is challenging to distinguish between the impacts of distinct inter­ventions. This shortcoming is a significant deter­rent in understanding how to effectively implement policies that enhance such objectives. We examine the impact of Double Up Food Bucks (DUFB), a prominent farmers market financial incentive pro­gram, on county-level direct-to-consumer (DTC) agricultural sales in Michigan. 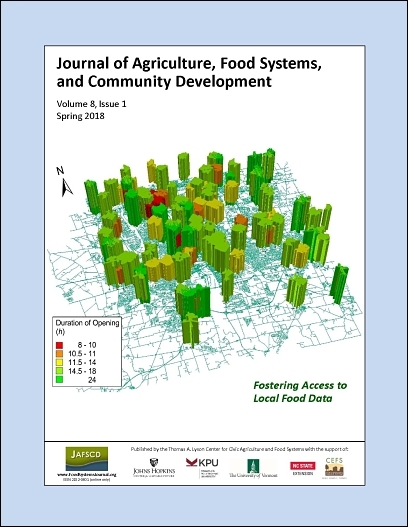 In our models, we distinguish between counties with farmers markets that do not accept SNAP, counties with markets that accept SNAP but not DUFB, and counties with markets that accept DUFB. We also estimate separate models that allow us to distinguish between the presence and magnitude of DUFB on county-level sales. We find that offering DUFB and accepting SNAP benefits were each associated with positive and statistically significant increases in direct marketing sales, and the magnitude of the DUFB coefficient was greater than the SNAP coefficient. Our preliminary evidence from coeffi­cient magnitudes also suggests that the county-level increase in direct sales exceeded the benefit levels.